Early ACCESS is Iowa’s system of early intervention services for infants and toddlers with or at risk for developmental delays. With our dedicated staff of compassionate professionals, Early ACCESS Iowa can connect you to local children’s providers within the Early ACCESS system. Easter Seals mission is to provide exceptional services to ensure that all people with disabilities or special needs and their families have equal opportunities to live, learn, work and play in their communities. The Iowa Home & Community Based Services (HCBS) waivers are Medicaid Programs from the federal government which have rules set aside or “waived”. This gives you more choices about how and where you receive services. It is for people with disabilities and older Iowans who need services. Many diseases and disorders are caused by a person’s genetic makeup. These include abnormalities in genes that occur randomly or because of environmental exposures. Other genetic factors “run in the family” and are inherited at birth from one or both parents. The Division of Medical Genetics, based in the University of Iowa Department of Pediatrics and UI Children’s Hospital, is a comprehensive statewide resource for families and health care professionals. The Arc believes that all people with intellectual and related developmental disabilities have strengths, abilities and inherent value; are equal before the law; and must be treated with dignity and respect. The Arc represents, supports and acts on behalf of individuals and their families regardless of level of disability or membership in The Arc. The Arc believes in self-determination by empowering people with the supports needed to make informed decisions and choices. Our goal is to provide education, support and advocacy to those individuals, their friends, families, and professionals in the Iowa City and Cedar Rapids area that are blessed by Down syndrome. 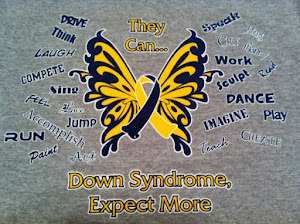 We hope that through our efforts, we can enhance the quality of life for all individuals with Down syndrome. They invite you to join families and friends of persons with Down Syndrome in the community. The Northwest Iowa Down Syndrome Society is an organization dedicated to the education and support of people in Northwest Iowa touched by Down Syndrome and other developmental disabilities. NW Iowa Down Syndrome Society started in the spring of 2006 as a group of families who have the common bond of a child with Down Syndrome. They are affiliated with the National Down Syndrome Society and National Down Syndrome Congress, and are guided by volunteer members who serve as our officers. We also receive support from the staff at Prairie Lakes Area Education Agency. Their goal is to support families through personal contact and networking opportunities, educational programs, meetings, and a future e-mail based newsletter. For further information on our organization or if you have any questions, please contact Scott Hallgren, President of NW Iowa Down Syndrome Society, at 712-580-6671 or by e-mail at hallgrens@smunet.net. For the Quad Cities Area covering Moline, ... including Davenport and Bettendorf in Iowa. Up With Down is a non-profit support and advocacy group for individuals with Downsyndrome and their families. We are based in Des Moines and serve more than 250 families in central Iowa. Designer Genes' mission is to provide information, resources, advocacy and support to individuals with Down syndrome, their families and their communities. The steps listed in our mission lead us as we strive to reach our vision of a community where all individuals with Down syndrome have opportunities and resources to live independently and to fully participate in all aspects of their communities.